First completed pair of socks! 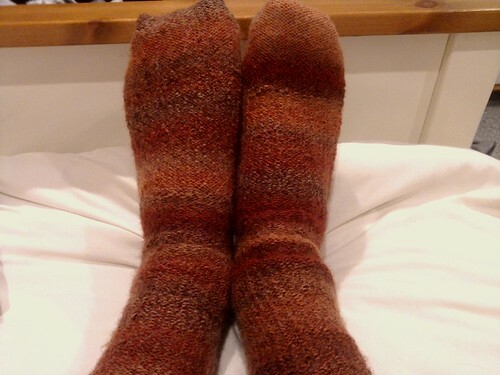 For over a year now, I have been knitting a pair of socks. I chose a sock, cuff-first, as my first foray into circular knitting. The circular knitting itself was not difficult to master. Socks themselves, though, have all sorts of … components that require careful attention to detail. This one had a pattern for the cuff, then another four-row pattern for the leg/top of the foot, and different patterns entirely for the heel flap and gusset. And then there is the most dread moment of any sock knitter’s career: turning the heel! Oddly enough, transatlantic travel has started to become somewhat ordinary for me. The first time it was new and exotic and somewhat terrifying. The second time it was a relief (to be going home, particularly because I hate travelling). The third time, with a different airline, was another adventure. But now, having done it a few more times and developed a routine for getting to and from the various airports, it is starting to feel old hat. Well, my travel back to the UK from Canada at the end of the Christmas break broke up that monotony for me. The original plan was to fly from Thunder Bay to Toronto with Westjet on Friday, January 3, landing two hours before my flight to England. Cutting it somewhat close, yes, but my alternative was a 6 am flight that would leave me in the airport all day. Those of you who follow me on Twitter or Facebook have probably heard the story of my epic journey to return to England. I’ll record it for posterity in a later blog post, when I have the time. For now, I simply wanted to note that I’ve published my annual list of best books I read in 2013. For the first time since I started making these lists, I’m not doing a companion “worst books” list. The books I read in 2013 were just that good! Well, there weren’t enough really bad ones, so I don’t think that a “worst” list would have the same significance. Here’s hoping I get a few stinkers in 2014.